Sasha Group — a digital marketing agency for small businesses — is a new company we launched at VaynerX that sits really close to my heart. My dad came to this country with virtually nothing. He didn’t speak English and didn’t have any money. We lived in a studio apartment the size of a small office with nine family members. He got a job as a “stock boy” at a liquor store for two dollars an hour in New Jersey. For years, he saved his money and eventually bought a small liquor store himself. Once I started working at his liquor store at 22 years old, I blew up the company to $60 million from $3 million in a short period of time. In early 2019, I launched The Sasha Group, a small business agency named after my dad. We assembled a team of people who have been helping small businesses grow for years. We have team members who helped a furniture company grow sales through branding, a beauty company add another $100,000 / month in revenue, a supplement company unlock real growth and scalability in business, and more. I’ve always been fascinated by people’s tendencies to listen to information and advice from people who have never actually done the thing they claim to be an “expert” at. A lot of small businesses hire agencies that are “fancy” — agencies that might have a nice website or advertise at events, but haven’t actually done the things they claim to be able to do. The truth is, small businesses just don’t have that kind of money to risk. When I was growing my family’s liquor store, we had a tiny marketing budget. We were doing $300,000 in gross profit – before expenses. After all the expenses were paid, we had almost no money. We didn’t have extra cash to throw around. We had to really focus on sales. A lot of small businesses are in a similar boat. Try to find an someone that has actually had a small business, grew it significantly, and is now starting an agency — or at least has a huge resume of other clients who have been satisfied by their work. When you’re growing a small business, you need a different mindset than the one you’d have when growing a big brand. With a small business, you just don’t have the same margin or room for error. The way I built Wine Library to a $60 million business with a tiny budget was by focusing my time and energy on underpriced attention. At the time, that meant buying up broad keywords on Google AdWords for really low cost. Today, it might mean running Facebook ads or Instagram story ads. That kind of thinking makes a big difference when growing a small business. A lot of small business owners struggle with finding the balance between “quality” and “quantity” when hiring marketing agencies. They assume that it’s always good to go for an agency that produces higher quantity of content for a cheaper cost. 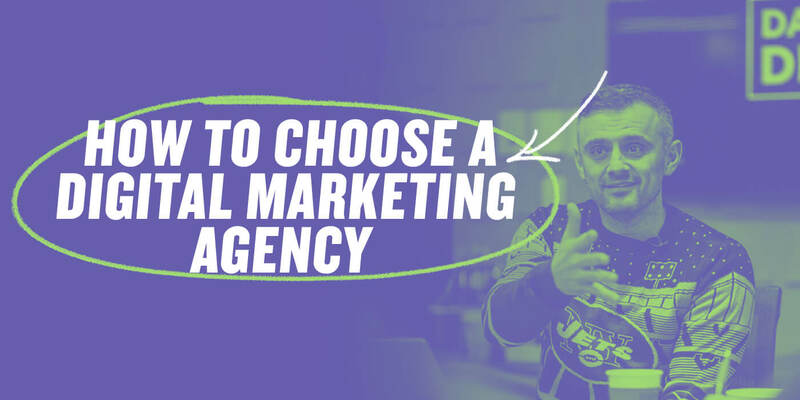 For example, a lot of businesses would rather go with an agency that produces 800 tweets for a $12k cost instead of another agency that produces 500 for the same fee. They might feel like they’re getting more for their money because they’re getting more content for the exact same price. It makes sense on the surface, but it’s actually a huge mistake. The truth is, quality and experience are important variables too. I could have someone make me a painting for $5 and another person make me a painting for $5 million. The biggest variable in price would be who the person is, and how much experience they really have in their craft. An agency that produces 800 pieces of content for $12k might actually be a “worse deal” than hiring an agency that produces 500 pieces of content for the same price if the agency that produces 500 pieces of content has more overall experience. For example, one strategy I really believe in for small businesses is to create a “Super Bowl Commercial.” What I mean by that is, creating an “iconic”, “hero” video like Dollar Shave Club or Purple Mattress did. If you create an iconic video and promote it via YouTube pre-roll ads targeted based on Google search terms that your customers are searching for, you could shape public perception of your brand – and drive a lot of sales. If done well, it could completely change the course of your business. Producing a quality video like that would take a sizable investment for a small business, and you’d want an agency that has a lot of experience in executing those strategies. A lot of agencies are motivated entirely by short term economics. They’re in it to make money right now. As a small business owner, it’s your job to sniff out whether the agency you’re looking at working with is incentivized by quick money. They might be raising capital and need a strong “bottom line” for investors, or they might be part of a holding company that evaluates them on short term performance. If they’re incentivized by short term gains, it won’t be as likely that they’ll care about you when you’re a customer. They’ll be more interested in acquiring you as a customer than doing good work once you actually start working with them. With VaynerX and the Sasha Group, I’m only playing for the long term. My intention is only to be historically correct and win your trust forever – even if that means we never do business together. For years, we only served big brands like Pepsi, GE, or Mondelez. We had so many small businesses asking us for help, but I didn’t want to take their money because we didn’t have a service offering ready for them. And I have no interest in taking people’s money if I can’t deliver. That’s why it took us so long to produce an offering for small businesses. If you have any other questions about hiring a small business marketing agency, hit up @TheSashaGroup on Twitter!